More than likely, the color of the hull had something to do with my reaction the morning I stood on the dock admiring Viking&apos;s 54 Convertible—if there&apos;s anything kickin&apos; around the marine scene today that looks better on a hull side or a transom than Viking&apos;s seafoam green, I&apos;ll be danged if I know what the heck it is. 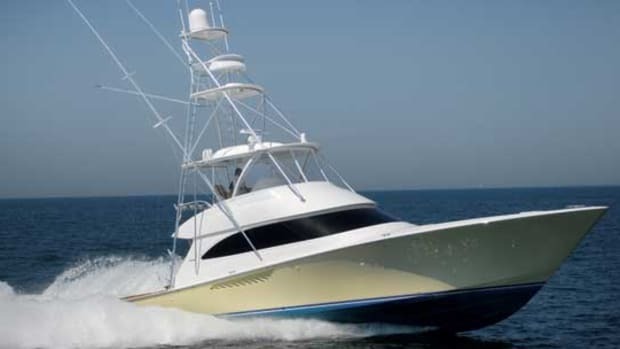 Add a glossy, snow-white superstructure, a teaky pair of Murray Products ladderbacks abaft the topside helm console, and a lofty welded-aluminum tower (all glowing in the low, limpid light of early morning), and I defy anybody in his right mind to steer clear of the daydreams that inevitably arise. You know the ones: deep, fishy, offshore waters; islands with lush, jungle-covered mountainsides; palm-fringed ports of call cooly beckoning from somewhere beyond the horizon. I dallied there awhile, not exactly transfixed, but not moving a whole lot, either. A golf cart—a major means of transport for the employees of Miami Beach Marina—softly whizzed past. The kid driving the cart slowed down long enough to comment authoritatively, "Viking...gorgeous boat, man." "You got it," I agreed. The description worked not only for the 54&apos;s overall appearance but for a host of superbly executed details I could easily catalog from where I stood. 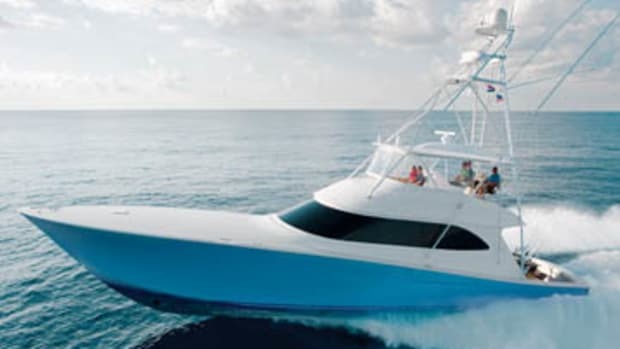 Up top, the flying bridge brandished an especially Viking-esque feature: deep electronics boxes molded into an angled dashboard just beyond the helm pod. 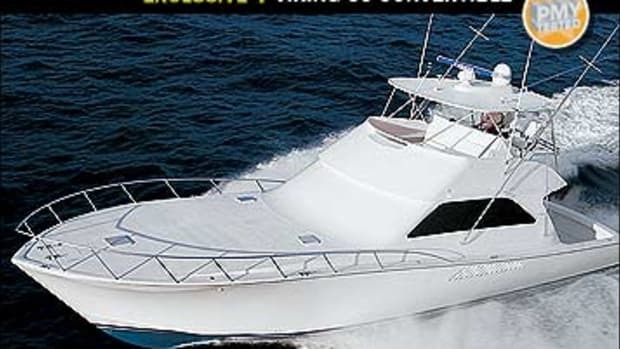 Covered with rubber-gasketed fiberglass hatches that have big, gin-clear acrylic panels and tight, push-button latches, these babies offered see-through navigation information without exposing the pricey electronic componentry to salt, rain, and other vexations of the harsh seafaring environment. The cockpit boasted some signature features as well. 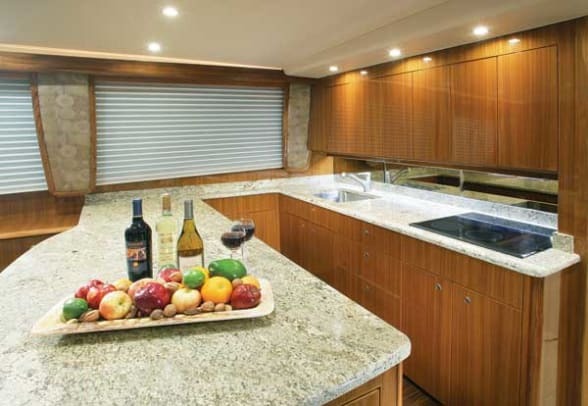 The mezzanine under the flying-bridge overhang promised protection from sun and spray—and thanks to cushy seating, comfort, too—to trollers and cruisers alike, without significantly affecting access to the engine-room companionway, the tackle and gear stowage locker, or the bait freezer. 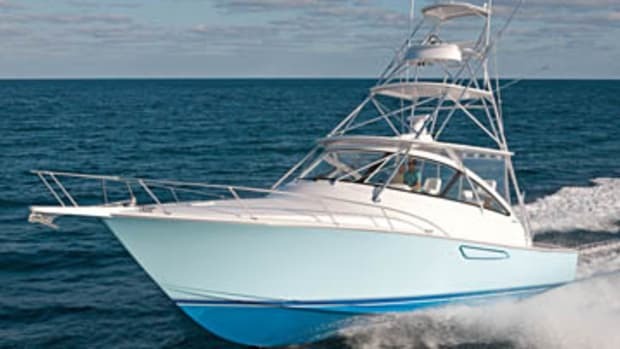 A 29-inch-wide, swing-out, walk-through transom door with liftgate (and padded strap to keep the door open when necessary) presaged the expeditious boating of trophy fish, and, helpful for fast catch-and-release action, the reach from the covering boards at the transom to the waterline appeared to be three feet at most. A unique shore-power-cord arrangement spotlighted the well-ordered simplicity Viking&apos;s famous for, even concerning the humblest of details: Instead of cluttering the sole of the cockpit, the 54&apos;s cord came through a small cutout at the top of a locker door under the port-side covering board, proceeded aft in hangers under the covering board (thus keeping it out of sight and out of the way), and exited via a polished chrome hawse cleat in the transom that was big enough to accommodate a 50-amp shorepower plug. And finally, there was the hull side itself—one of the prettiest swathes of end-grain-cored, vacuum-bagged, epoxy-skinned fiberglass I&apos;d seen in ages. Viking&apos;s been resin-infusing small parts like tanks (for fuel, water, and waste), air-supply boxes, and rod locker pods for a couple of years now, but the company continues to employ highly controlled, labor-intensive, conventional hand-layup methods on its hulls and deck/superstructures, feeling that while resin-infusion may work wonderfully for small, behind-the-scenes components, it&apos;s not yet ready for large, visible applications where cosmetics are critical. Certainly the 54&apos;s glasswork had the look of impeccability that morning. Sighting down the port hull side, I could see no evidence of waviness, print-through, resin-pocket glitches, or wrinkles. Just creamy-smooth isophthalic gelcoat. "So let&apos;s see if we can get this crab car cranked," said Viking&apos;s director of communications, Peter Frederiksen, walking up from behind and accompanied by company captain Ryan Higgins. The two of them soon had our twin 1,550-mhp MAN V12 1550 CRMs fired up. 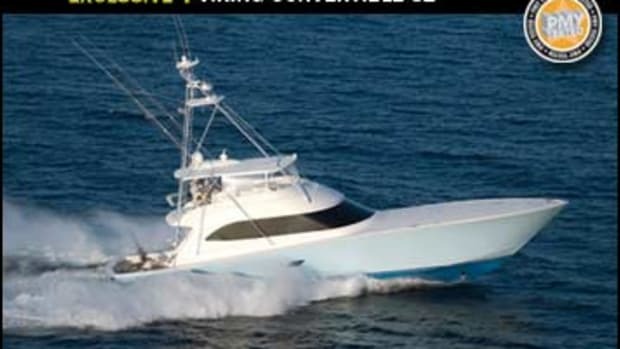 I&apos;d like to say that based on personal experience, the 54&apos;s maneuvering prowess dockside is spectacular, but I can&apos;t. When I suggested to Higgins that I take the test boat out of her slip, he informed me that company policy stipulates that magazine editors not take control of test boats until they reach open water—in our case, the modestly sporty Atlantic well beyond the jetties of Miami&apos;s Government Cut. 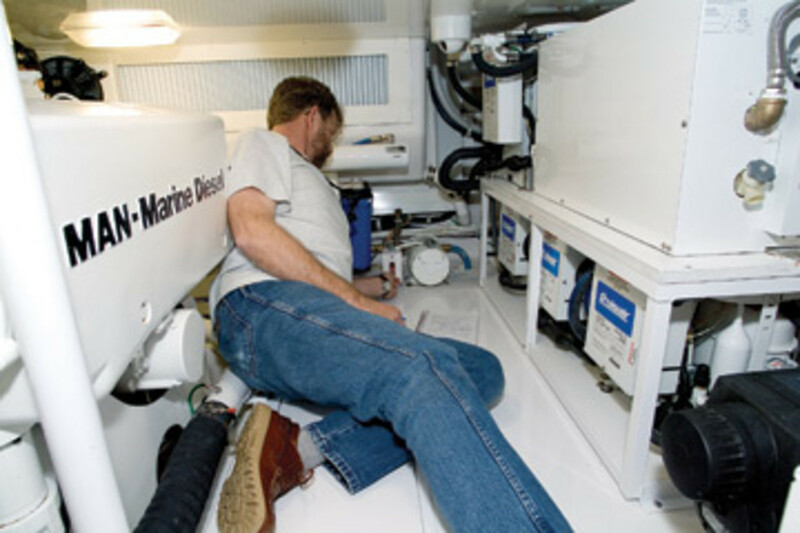 This development was disappointing to say the least, given that docking and/or undocking a variety of test boats has become over the years one of the most enjoyable and often informative aspects of the work I do. Nevertheless, the 54 seemed to respond lithely to Higgins&apos; economic use of her Palm Beach-style engine controls while coming out of the slip and reacted much the same way when he backed her home after our sea trial was over. The speeds we got in open water were impressive. Seas crested somewhere between two and four feet during the trial, the wind was fresh, and all we could see off to the east was dark, inky-blue water and foamy white horses. 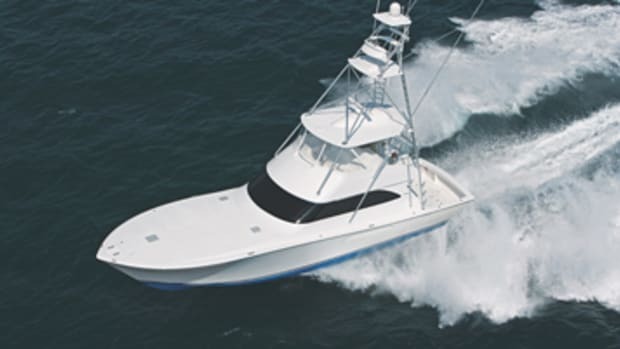 Viking builds robust, comparatively heavy vessels—our test boat was pushing 78,000 pounds with full fuel and a welded-aluminum tower (with upper control station) courtesy of Viking&apos;s two Florida-based sister companies, Atlantic Marine Electronics and Palm Beach Towers. But despite the extra weight and wind resistance inherent in these two factors, the 54 turned in an average top hop of 47.4 mph (41.2 knots). And what a groovy driving experience. While visibility from the centerline helm was good all the way around, it was particularly fine forward thanks to a cutout (with precisely fitted clear Plexiglas insert) in the swept-back cowling. 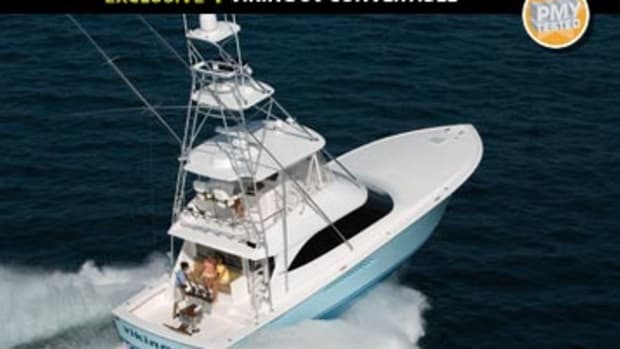 Cornering was sharp, smooth, and exciting, given the power-assisted Teleflex Sea-Star hydraulics, and the ride was even smoother—nothing beats a seriously raked, sea-slicing stem, a set of efficiency-boosting pocketed propellers, and a solid, slippery running surface (with a modest 15-degree transom deadrise) for comfy, stable, joyriding fun. And nothing beats bow flare, either—and exactly the right amount of it—for keeping spray where it belongs, particularly while charging head seas. 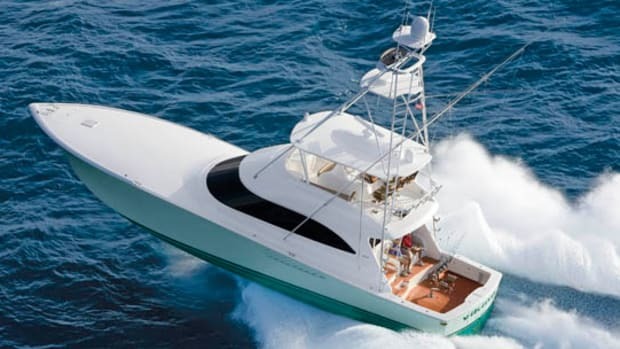 We got back to Miami Beach Marina at noon with plenty of time to top off the 54 at the fuel dock and then do a thorough dockside walk-through. What impressed me most about the boat&apos;s three-stateroom, two-head layout was the level of liveaboard comfort extant everywhere. 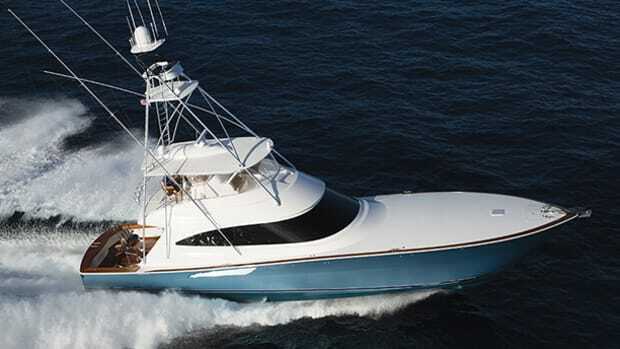 According to Frederiksen, almost 40 percent of Viking owners spend time simply cruising, and features like a U-shape galley with Corian countertops and every conceivable appliance; heads with Amtico vinyl flooring and one-piece fiberglass shower stalls; and a mind-boggling array of lockers, cabinets, and drawers for stowage help them enjoy it. In the 54&apos;s stand-up engine room, just a tad warm from the morning&apos;s exertions, all the Viking stalwarts were on hand: web-type, powdercoated steel beams under the engines, secured to intermediate transversals on either end to nix vibration and preserve a precise engine alignment; inboard placement of oil and fuel filters to facilitate element changes; cleanly installed Delta T ventilation system with huge supply and discharge fans; gear-type oil-change system (with cockpit quick connect) for engines, transmissions, and genset; and last but not least, big Y-valved crash pumps coming off each main. "As fine an engine room as I&apos;ve ever seen," I concluded, wiping sweat as Frederiksen and I headed for a shady spot on the mezzanine settee. 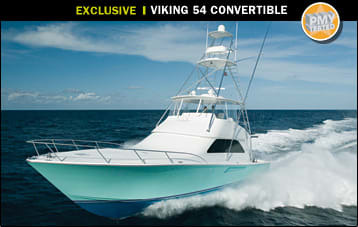 And indeed, every aspect of the Viking 54 Convertible I&apos;d either seen or experienced had qualified for the same description. Finish, performance, outfitting, engineering—all splendidly done. And that gorgeous seafoam-green hull? Well now, that was super fine. Have you ever wandered around a boat with a settee cushion that you can’t find a temporary home for? Just so you can get at the hand vac or pile of electronics manuals in the locker underneath before putting the darn cushion back? 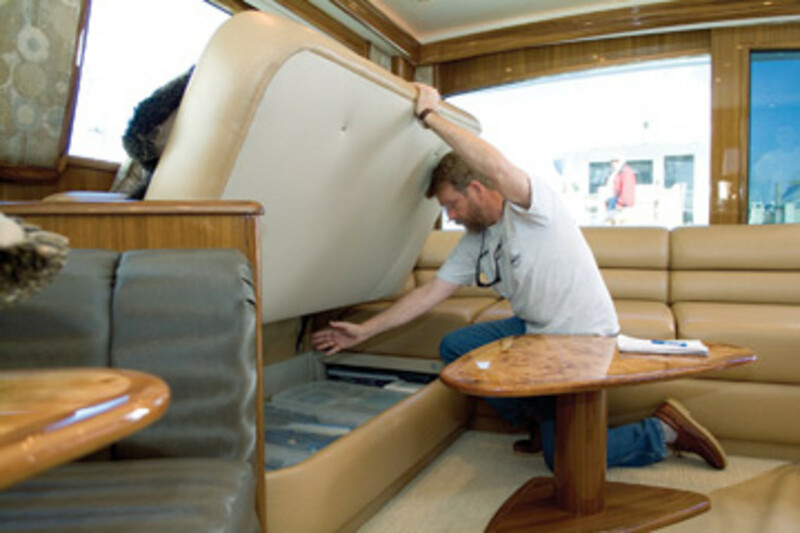 Our Viking had a elegantly simple solution in the L-shape settee, which is in the after starboard corner of the saloon. The cushion and settee back are combined into a single, nicely upholstered piece. To finish the job off, hinges are affixed so that the whole thing—seat and back—swings up and out of the way, giving you total one-handed access.—B.P.